“Dance in the Shadow” filmed in 2005. Partners for Planning and L’Arche Canada collaborated to develop an Educational Kit using these 2 films which can be accessed on the Dance in the Shadow link. This kit is being used in elementary and secondary schools in Ontario. There are also suggestions of questions which could be used for discussion purposes at retreats and workshops. If someone wanted a DVD of both films with extras including the full dances, they can contact Susan Beayni at susan.beayni (at) outlook.com. The films are being seen in over 70 countries and were shown at the United Nations in NY as they were developing the United Nations Convention on Rights for People with Disabilities. Rebecca and her Spirit Mover dancer friends were invited to attend a Liturgical Dance course at Boston College in 2004. The article below was written by Fr. Robert Vereecke who led the course. Dance then wherever you may be, I am the Lord of the Dance said he. And I’ll lead you all wherever you may be, and I’ll lead you all in the Dance says he. This past summer, however, the experience was more powerful than ever before. Six members of the L’Arche Daybreak community came from in Richmond Hill, Ontario to participate in the two week summer dance program. All are members of “Spirit Movers”, a dance company that is an integral part of this L’Arche community. I had encountered the work of “Spirit Movers” in Toronto at Regis College and at the World Youth Day where their dance company and mine, the Boston Liturgical Dance Ensemble were dancing for liturgies where Pope John Paul II was presiding. Since many members of L’Arche travel in wheelchairs and move with the help of their assistants, I was wondering how we would approach the integration of a wide variety of movement expressions, including those whose movement range was limited physically but expanded significantly with the use of the wheel chairs. Any apprehension I had about how we would find a common language of movement expression soon disappeared as I witnessed the loving interaction between Mike and his assistant Steve and Rebecca and her dance partner Anna. In addition to the forward, backward and turning movement of the wheel chairs, these two couples partnered beautifully as their bodies would create shape and form together. Neither Mike nor Rebecca is able to communicate with verbal language but they speak volumes with their facial expressions and their limited physical movement range. Over and over again I was humbled to see the ways in which the slightest movement and gesture could express the depth of the emotion living in the depths of these individuals. Since the Psalms are the most powerfully “embodied” prayers in the Scriptures, we would work with their texts and musical settings, finding gestures and movements that would bring them to life. In one exercise on psalm 42 each person would find words in the psalms that they chose to use to express in movement. The words from the psalm that Steve and Mike chose were “my rock”, “my body”. “my God”. For this psalm prayer Steve, removing Mike from his chair, cradled him in a way that spoke powerfully of the way in which God is incarnate in the lives of each person. These two bodies, one dependent on the other for movement from place to place, the other dependent on the one for strength and grace, reminds those of us who witnessed their simple prayer of how vulnerable each of us is and how we need the support and strength of the other in our journeys toward God. During those two weeks with Rebecca and Mike, with all our turning and bowing and bending, I was reminded of what extraordinary gifts people have and are. It is often from those from who we expect so little, that we receive so much! Rebecca and Mike with their caring assistants reminded me that we are all invited to follow the lead of the one who is the “Lord of the Dance”. 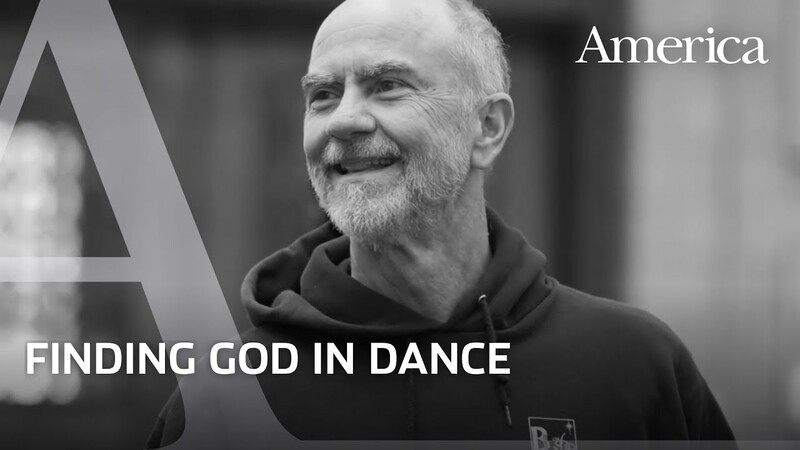 I have always had a passion for any kind of dance and especially like to meet with others who connect with the Divine through dance. Working towards social justice for all has been integral in my life so I taught in Nigeria for 4 years where I met my husband of 36 years who is from Lebanon. After Nigeria, we lived in Lebanon during the war from 1980-84. Our eldest daughter, Rebecca was born during that time. I have travelled to various places in Africa, the Middle East, S.America and Nepal over the years. Through lived experience with my 33 year old daughter Rebecca, I have advocated for and supported individuals with unique needs and their families to plan for a good life while gathering a network to assist in implementing their plan. I live in Toronto and am one of the founders of Partners for Planning http://www.partnersforplanning.ca where my role is Family Support Coordinator.